Did you know, that half of all U.S. millennials use Pinterest? It’s not just young people saving their ideas on the network: 68% of U.S. women between the ages of 25 and 54 use Pinterest, too. And while it’s true that the network does have more female users than male, 40% of new users are men. 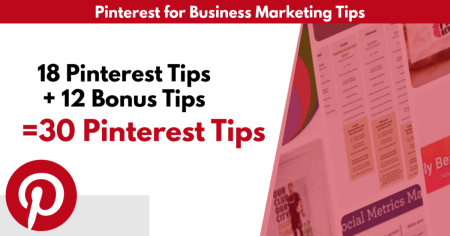 No matter who your target audience is, take your Pinterest for business marketing to the next level with these top Pinterest tips. 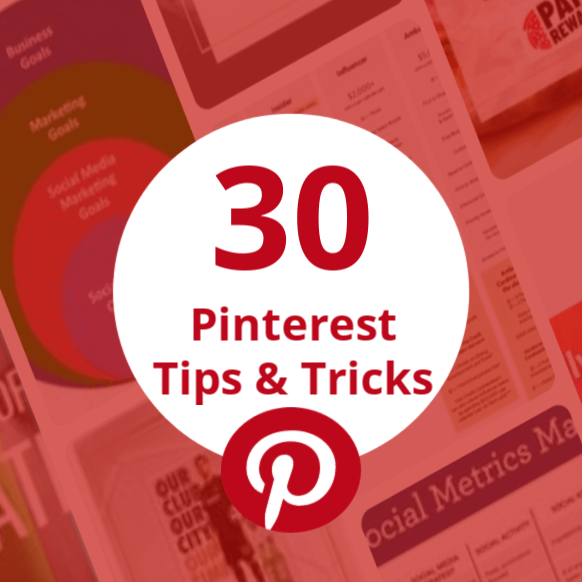 Here are 18 tips to help make the most of your marketing on Pinterest. Pin Regularly ­­– Similar to other social media platforms, Pinterest wants users to add pins in a regular and consistent basis and always pinning fresh content. Create Multiple Pins – Drive new visits and traffic to your site or blog by creating multiple pins that link to the same post or page. Be creative in your descriptions, don’t use the same description on all the pins, this will help increase exposure in the Pinterest Smart Feed and SEO. 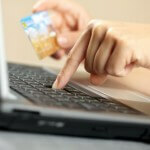 Optimize Your Pins – When crafting the description of your pins, it’s important to add keywords that are both specific about the item(s) in the pin, and as it relates to broad themes or ideas that are related to that pin. Also, it is recommended that you match (as close as possible) the content of the pin with the content it is linking to on your website. Optimize Your Boards – Just like you optimize pins with keyword rich description, be sure to do the same for your boards. Use relevant keywords for board names as well as the description. You can also create sections within your boards, which may enhance future search. Also, be sure to optimize your profile with keyword rich description of your business. Confirm Your Website – Confirming your website lets you see what people Pin from your website, and adds your logo to any Pins made from your site. This will also boost your Pins’ rankings in search results. Following Tab – This is a dedicated space in the app where Pinterest distributes exclusive content to your followers. It’s a great way to get your content seen in real time to people who are following you. The First Five Pins – There is no limit nor is it bad to post multiple pins per day, however the first five pins that you pin each day should be the most important. In the following tab, Pinterest will show followers five pins from each of the brands that they follow, then rotate through all the other brands before they show them the next five pins. Cover Banner – With the new cover design there are several display options. You can choose to highlight your latest pins or pins from a specific board. Using Hashtags – They’re back! You can now add hashtags to new pins, (don’t worry about updating older pins) make sure they are relevant, general themes, and add no more than 20 hashtags on each pin. Save It Button – Be sure that the content on your website is easy to share. Don’t miss the chance to let users pin from catalog pages, blog post, and individual product pages. Put a pin button on all owned content. Incorporate the save button into your social sharing area on each page of your site. Adding Follow Button on Blog/Website – The follow button lets Pinners easily follow your business’ Pinterest page. Followers will see your newly added Pins, giving you more visibility. Add the Profile Widget – Like the Follow button, the profile widget also leads your website visitors to your Pinterest page. It’s bigger than the Follow button and can display up to 30 of your latest pins and may be more effective. 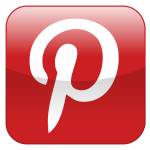 Engage Pinterest Followers – Repin, “like” or comment on pins and boards of others. Interact with your followers and take the time to participate. Thank your pinners. Pinterest offers the ability to interact with your brand’s ideal customers in a direct, authentic way. Mix it Up – Avoid the “me syndrome” of pinning about your products. Connect with your target customers by pinning about inspirations, interests and your customer’s lifestyle. How-to guides, DIY activities, and recipes are most likely to go viral if you’re in any of those sectors. Be Aware of Copyrights – Make sure you always credit images and link back to the original source. For more information see Pinterest’s terms and conditions for use of third-party content. Add Videos – Images are not the only things that can be pinned. YouTube videos can be pinned to boards in the same way as any other image. If you have how-to videos or presentations, this would be a great place to add them for additional exposure. Make it Personal – Use it show a different side to you and your business. Show behind the scenes at your office with boards about your staff or about a non-profit or cause you support. 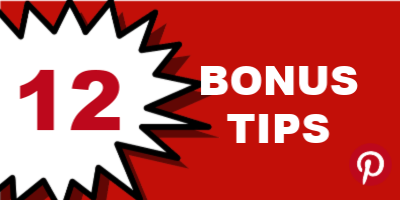 As a bonus, we’ve added another 12 tips to ensure you don’t miss any opportunities to leverage Pinterest to connect and engage with your customers. Pin What’s Hot – Whether it’s a book that received exposure on a talk show or the latest fashion trends, users want to see what everyone’s is talking about. If you pin this type of content to your boards, you can draw that trend-seeking crowd to follow you, just make sure it’s relevant to your business. Your team can also look at the Pinterest page that shows every item pinned from your site and your competitor(s): http://pinterest.com/source/yoursite.com. For example, you can look at who is pinning from the Kohl’s website or Adidas.com. Cross-Promote – Tell your Facebook, Instagram and Twitter fans and followers to join the party. Include a few of your best Pinterest pins in your newsletter or your regular emails. Use a Variety of Images —It’s best to pin high-quality photos and avoid human faces on your pins (test this for your brand). Overall, lifestyle images are your best choice and when possible add overlay text to offer more context. The perfect Pin size is an aspect ratio of 2:3. Recommended size by Pinterest is 600 by 900 with and the maximum dimension is 1260 long. Get Seasonal — Pinterest curates its own content with weekly collections called “Pin Picks,” which fit into current seasons, trends, and holidays. Your brand can create a more personal connection with Pinners with content that is timely and relevant to the season or holiday. It’s recommended to pin seasonal items 45 days in advance of the holiday. Leverage Rich Pins — If you’re in the e-commerce biz, you may consider employing Rich Pins so users can see the price and availability of a product right on the Pin itself. Check Traffic – Use Google analytics to track what images and content are driving site traffic. Join Communities – An improved version of group boards, Communities are a new way that pinners can use for communication, to promote their business to new audiences. Rearrange Pinterest Boards — If you have boards that are more relevant for the season or your current business priorities have changed, you can rearrange the order of your Pinterest boards on your profile page to reflect the season or their importance. Do Not Delete Pins that are not Performing – If you think that they are probably hurting your performing pins, don’t worry. The performance of a pin has no effects on the rest of your pins. Auto Scheduling vs. Manual Scheduling in Pinterest – According to Pinterest, it does not matter whether you use a 3rd party tool to schedule pins or pinning directly on Pinterest. Pinterest Promoted Pins – Promoted Pins are a great way to get your Pins seen by more people. They can also provide exposure beyond what you pay for; data shows that advertisers get more organic clicks in the month following the launch of a Pinterest ad campaign. Pinterest’s Buyable Pins – Buyable pins let users purchase directly off of a pin, without ever leaving Pinterest. Need help narrowing down where to get started using Pinterest? This Pinterest Infographic provides 10 tips to help you get started in promoting your business on Pinterest.